Often found in low priced grass seed. It does not over-winter in cold climates. Germinates quickly and can be used as a temporary ground cover while the slower growing bluegrass plants take hold. Used mostly as a forage plant for animals. 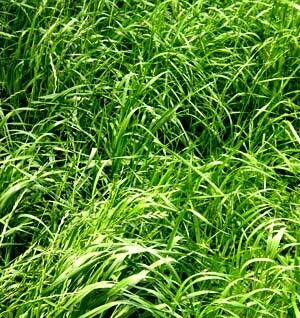 DO NOT PLANT GRASSES INTENDED FOR HOME USE IN PASTURE AREAS. Certain toxins may increase in lawn grasses that may be harmful to grazing animals. Check with manufacturer on suitability. Ryegrasses are widely distributed throughout the United States. In the South, annual ryegrass appears each fall from natural reseeding. In the transition zone, perennial ryegrass is used in mixtures with bluegrass for sports fields. Ryegrasses are widely used as a temporary turfgrass throughout the southern region for overseeding dormant warm season grasses. On bermudagrass lawns where color is more important than density, ryegrass may be seeded at 5 - 7 pounds per 1,000 sq. ft. In these overseeding situations, ryegrass seed are broadcast over the surface of a closely mowed bermudagrass turf. Seeding dates are very important when overseeding a bermudagrass turf. If overseeding is done too early, bermudagrass competes with the ryegrass seedlings and establishment may be poor. If overseeding is delayed, then cold temperatures may delay germination. The recommended seeding date is 2 - 4 weeks before the average first frost date.